5 Pieces Set Includes: (1).. PKT1: 1 P.K. Thomas Waxing Instrument Ideal for waxing procedures and techniques, PKT1 features curved tapered tips used to flow on molten wax. (2).. PKT2: 2 P.K. Thomas Waxing Instrument Ideal for waxing procedures and techniques, PKT2 features curved tapered tips used to flow on molten wax. 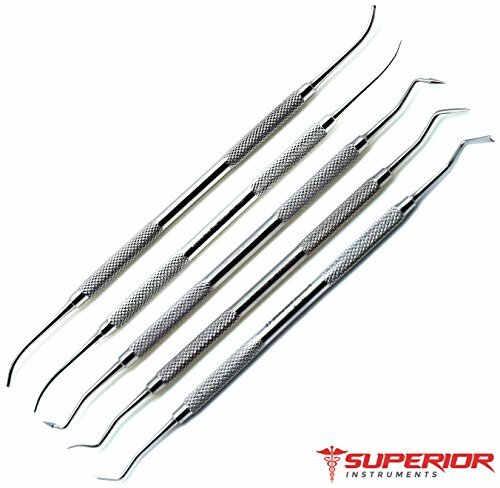 (3).. PKT3: Ideal for waxing procedures and techniques, PKT3 features a pointed burnisher used to perfect and enhance the supplemental and developmental grooves. (4).. PKT4: Ideal for waxing procedures and techniques, PKT4 is a modified carver used to perfect the external contours and remove excess wax at the cavo-surface margins. (5).. PKT5: Ideal for waxing procedures and techniques, PKT5 is a special carver used to remove excess wax as cusp ridges are developed; its contour maintains desired convexity at these ridges.